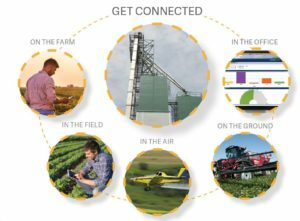 Raven Technology’s acquisition of AgSync brings ERP, agronomy, and in-cab applications together, creating a seamless system allowing better planning, tracking and recording. With the acquisition of digital platform AgSync, Raven Industries — already the industry leader in machine-connection technology — will close the data loop. From the initial order, to application, to finalizing the recordkeeping, the process is now seamless, reducing redundancy, risk of error, and manual paper handling. Because of efficiencies gained by better logistics management in the field and fewer administrative tasks taking place in the cab, applicators can cover more acres per hour, increasing revenue. Most retailers end up with technology “silos,” where separate software systems handle orders, agronomic prescriptions to the field, invoicing, recordkeeping and other functions. AgSync is the platform that takes those disparate systems and funnels them down to an operations function where they work together to create and process each work order from start to finish. product, fuel and other support functions. Because the order information never leaves the data system, changes — which are inevitable — are much easier to make on the fly. And because the various data silos are now working together, changes can be entered in one place. Each of these technologies offer management efficiencies on their own. Together they are a powerhouse. Drew Spidahl, owner of Highland Chemical Inc. dba Ag-Tech in Stockton, IL, started using AgSync for aerial application in 2008 and for ground application in 2014.
is transferred as soon as the application is completed. Spidahl says AgSync allows him to group jobs based on product mix and location, reducing redundancy and saving time. A notification system is built in as well. An email or text is sent to the operations manger and grower when the job is completed, which includes the acreage sprayed and what was applied. From a compliance standpoint, that’s a real benefit for growers who need to comply with state reporting regulations, Rassi says. If you already have AgSync in your operation, and you don’t have Slingshot, you won’t notice a change. But if you add Slingshot, you will no longer need a separate device in the cab. And you will never lose visibility of the order or its status. The order will go directly to the cab. If you already have Slingshot and add AgSync, you will gain the operational efficiencies of AgSync, plus it will soon be integrated into the Viper® 4 display. This simplifies the operator’s interface, closes the data loop back to the ERP and inventory systems, and eliminates the need for a separate device in the cab. The orders will be linked from the system to the machine and back again. Welbig says both systems are fully operational now, and the new functionality within the Viper 4 display will be available this summer. Many factors can negatively impact application rates, spray pattern, spray performance, and the overall accuracy of products applied to crops. Some are obvious, like wind, rain and human error. And, there are many not-so-obvious elements that can inhibit a proper spray application, such as boom height control and steering. There are a number of benefits to having jobs entered in one place and then sent to the operator in the field — saving time, reducing risk of error, and more accurate recordkeeping. New tools are available to simplify the process.